The Bible Study Group will resume meetings on Wednesday 22nd April. We meet from 2.30pm. till 3.30pm. at Oakhurst (behind Kingshott School) home of Margaret Edmonds. We will be continuing our study of St. Luke's Gospel. If you would like to join the group please contact Margaret Edmonds (01462-452340) or Clare Larsen (01462-453541). Wednesday 25th April ‘Fair in the Square’ in Hitchin Market Square. A fair to support all our local Primary schools including St Ippolyts and Wymondley schools. Monday 27th April 12.30pm Funeral of George McPhee RIP at St John’s Cemetery Chapel, Hitchin. Saturday May 2nd 2.30pm onwards, Spring Fair at Gosmore Care home. Please support this event. The funds raised will be used for social activities for the residents. THREE NOTICES FROM "CHURCHES TOGETHER IN HITCHIN"
2. Taizé service at St Mark's As part of its celebration of St Mark's Day, St Mark's church is having a Taizé service at 6.30pm on Sunday 26 April. This will include Taizé chants led by the choir, a reflection by Margaret Johnson of St Mary's, Pirton, and time for quiet devotion. Members of all churches are very welcome to attend. 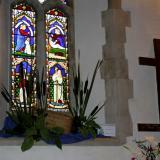 Once again many thanksto everyone who helped in any way to make our churches look so beautiful over Easter. The April edition of Seeround is out now on line. The Diocesan Magazine ‘Seeround’ is for all of us. It is now available on line. This is at Christchurch, Hitchin 7.30 pm on Wednesday 22 April. Friday 17th April 11.30am Memorial service in St Mary’s Church, Little Wymondley for Phyllis Allardice RIP, followed by Burial of her ashes in the churchyard. 3.30pm Burial of Ashes in St Ippolyts Churchyard of Alan Rowan Robinson RIP. 12.30 Tuesday 21st April 12.30pm Harwood Park Crematorium Funeral of Ronald Standley RIP. St Mary’s Great Wymondley today, 12th April at 10.45am following on from the 9.30am service. We extend our thanks today to The Revd Diane Fitzgerald Clark, for leading us through the services from Maundy Thursday to today, Easter Day. Many thanks to everyone who has helped in any way to make our churches look so beautiful for this special day. St Ippolyts Parish Hall. All 31 adults and 19 children thoroughly enjoyed the activities and worship. And thank you to all who helped and all who came to our Lent Lunches in St Ippolyts Parish Hall. The grand total raised was £551.64, (Actually we raised £641.64 as another £90 was raised last Wednesday!! M.S.H) to be divided between the Missionary Charity ‘Us’ and Research into Motor Neurone Disease. Thank you. Wednesday 8th April – there will NOT be a service today. Thursday 9th April 1.45pm at Luton Crematorium, funeral of John Dyer RIP. 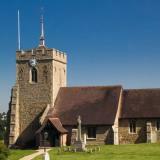 St Mary’s Great Wymondley Sunday 12th April at 10.45am following on from the 9.30am service. SSSSSSSSSSSShhhhhhhhhhhhhhhh shall I tell you something? There’s to be an election next month? Oh did you already know? Like me no doubt, you have become a little tired of the same old subjects being talked about over and over again, promises, promises, all we have to do is vote on the big judgement day and everything will be just as we would like it to be. Well maybe not, but even so I do hope you will use your democratic right and place a cross against someone’s name on 7th May. For if you don’t vote you will have no good reason to complain about the next government! Enough of my election soapbox. This month of April begins with the wonderful days from Maundy Thursday to Easter Day, when once again we hear the same old subjects being talked about, Jesus washing his disciples feet, to show he came to serve others, Jesus sharing bread and wine with his friends and leaving us with a lasting memorial that week by week is re-presented in churches throughout the world, and Jesus having a cross placed against him and dying for you and me so that when the great Judgement day comes everything will be just as God would like it to be. The words have been said and sung over and over again at so many Easter Services but unlike election manifestos and party politics, the words ‘Alleluia Christ is risen!’ are words I never tire of hearing. God’s promise has been kept, love has conquered even death itself. This time of year sees us busy in our gardens, the birds sing out, the hedges and trees come into leaf and the sound of the lawnmower is heard! Oh to be in England on a lovely spring day. Some of you will know that every Sunday afternoon I sit down and listen to gardener’s question time. Again and again the same subjects come up, the seed packets promise us success everytime, but we of course know differently. And how do you deal with slugs, expensive copper bands on the ornamental pots, grit around the hostas or special ‘slug pubs buried in the ground. No, what they need is one of my ‘girlies’, there’s a whole new meaning to a hen party. Maybe that’s one party I would vote for! I like to think my ‘girlies’ know the true meaning of Easter, their eggsclamation everyday, if we could just translate it, is I am sure, ‘Alleluia Christ is risen! (the vicar’s woken up and our food is on it’s way’). I hope you will join in theirs and my song this Easter, at one of our churches, for as St Augustine sung all those years ago ‘We are an Easter people and Alleluia is our song’. Maundy Thursday 7.30pm Eucharist of the Last Supper. After this service there will be the opportunity to stay for silent prayer. Good Friday 10am St Ippolyts Parish Hall, beginning with Hot Cross Buns and coffee/tea A service for all the family, complete with activities, songs, readings and prayers. Jesus’ last hour on the cross. St Ippolyts School Easter Service, in school and church. Maundy Thursday 11am St Albans Abbey Chrism Mass at this service Readers, and clergy renew their vows, and all the oils for Baptisms, and anointing services this coming year are blessed. All are welcome to attend. St Ippolyts and Wymondley Schools, we wish them a happy Easter Holiday. Saturday 4th – from 9am we will be decorating St Ippolyts church, please come and help, and make the church look really lovely for Easter. St Mary’s at Great and St Mary’s at Little Wymondley will also be decorated this morning so please join in. is forall of us. It is now available on line.